We have constructed two willow genetic linkage maps based on two mapping populations. The first more detailed map (S1) is based on a S. viminalis x (S. viminalis x S. schwerinii) cross using SNP, microsatellite and AFLP markers. The consensus S1 map with 495 linked markers formed 19 linkage groups and was aligned to the poplar physical map. The map spanned 2.477 cM with an average interval between the markers of 5.0 cM. The second map (S3) is based on a S.viminalis x S. viminalis cross and SNP and microsatellite markers. The S3 consensus map with 221 markers spanned 1.793 cM with an average interval between the markers of 8.1 cM. Both maps are considerably more detailed than previously available willow linkage maps, and in contrast to those they are to a large extent based on SNP markers for which the corresponding positions in the poplar genome are known. We are thus able to perform a detailed study of chromosome evolution in the Salicaceae family. Two major interchromosomal rearrangements distinguish the karyotype of willow from poplar, involving poplar LG I and XVI and willow LG Ia and Ib (Figure). Generally, gene order within syntenic groups is very well conserved in the willow - poplar comparison. However, the data indicate a few differences between the two genomes, five of which are inversions involving several markers each. Three of these are located on LG Ib (Figure) and correspond in size to circa 1.6 - 5.4 Mb in the poplar genome sequence. Sofia Berlin, Ulf Lagercrantz, Sara von Arnold, Torbjörn Öst and Ann Christin Rönnberg-Wästljung. High-density linkage mapping and evolution of paralogs and orthologs in Salix and Populus. BMC Genomics, 2010, 11: 129. Linkage group Ib for the S1 map aligned to the poplar homologous LGs. This shows that markers linked to willow LG Ib are located on poplar LG I and XVI, suggesting either a fission or a fusion in one of the lineages since their divergence. 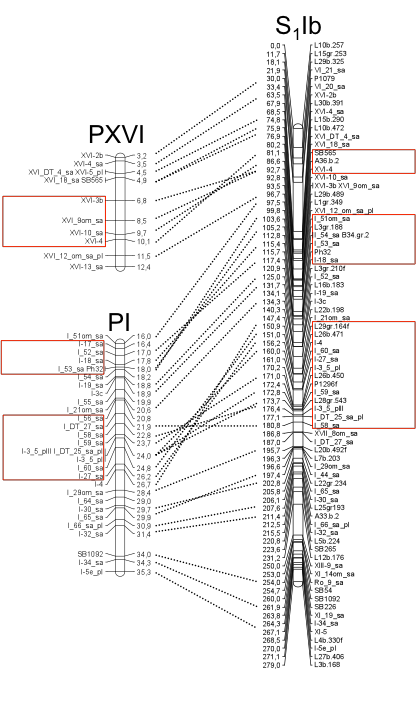 The red boxes show intrachromosomal inversions.